PURPOSE OF STUDY: Percutaneous screw fixation of sacroiliac joint dislocations, fracture-dislocations and sacral fractures is a well-recognised technique first described by Routt and has increasingly gained popularity in recent times. This method is biomechanically comparable to open reduction and internal fixation with plates and screws but offers the advantages of minimally invasive surgical techniques. It is however a technically demanding procedure with reported complications including hardware failure, misplacement of screws, nerve injury and poor posterior reduction. The purpose of the study is to report clinical and radiological results of patients treated with closed reduction and percutaneous iliosacral screw fixation for unstable pelvic ring fractures. METHODS: A retrospective review of clinical notes and radiological studies was performed on all patients who had percutaneous sacroiliac fixation between 2009 and 2012. 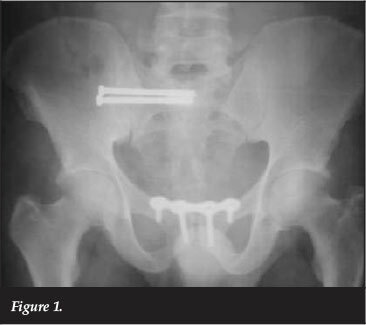 Forty-five percutaneous sacroiliac screws were inserted in 41 patients with a mean age of 25.6 years (range 17-62). Fracture types included 15 AO type B, and 26 AO type C.
RESULTS: All patients had a satisfactory initial reduction. One patient (2.4%) had screw misplacement with resultant temporary neurological fallout. One patient (2.4%) had screw misplacement without neurological fallout. Both these patients initially had two screws inserted and the misplaced screws were removed and not resited. One patient (2.4%) had screw cut-out with loss of reduction. This screw was removed, open reduction performed, and the screw was reinserted. CONCLUSION: The use of percutaneous sacroiliac screws provides a safe and effective technique for the management of unstable posterior pelvic ring injuries. Our combined complication rate compares favourably with published literature. The worldwide increase in high energy trauma has led to an increase in the number of unstable pelvis injuries. Unstable pelvic ring injuries usually occur in polytrauma patients and are associated with high mortality and morbidity rates.1,2 Percutaneous screw fixation of sacroiliac joint dislocations, fracture-disloca-tions and sacral fractures has gained increased popularity worldwide in recent times. The high reported complication rates of pelvic fractures are not only related to the injuries. High morbidity rates are also related to the traditional methods of open reduction and internal fixation used to achieve and maintain the desired anatomical reduction. These complications are mostly related to wound breakdown. Large extensile approaches through attenuated soft tissues have in the past led to wound-related complications as high as 27%.4 The pelvic haematoma can also be disturbed which can lead to secondary blood loss. Because of these complications, surgery was often delayed to allow the soft tissues to settle down and the pelvic haematoma to mature. Percutaneous fixation of pelvic injuries (Figure 1) was first described by Routt in 1993.8 This method is biomechanically comparable to open reduction and internal fixation with plates and screws but offers the advantages of minimally invasive surgical techniques. Performing percutaneous fixation is associated with certain complications. The complications previously reported are neurological injury, with rates reported between 0% and 8%, and misplaced screws, between 2% and 12%.4,7 This study compares our complication rates with those published in the literature. A retrospective review of clinical notes and radiological studies was performed on all patients who underwent percutaneous sacroiliac fixation between 2009 and 2012 at our institution. 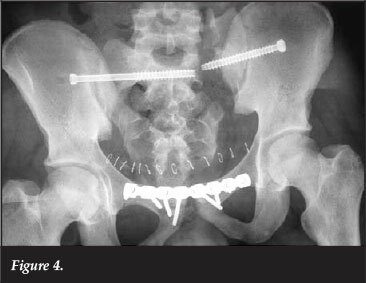 Forty-five percutaneous sacroiliac screws were inserted in 41 patients. One patient had bilateral, single sacroiliac screws inserted and three patients had two ipsilateral screws inserted into the S1 segment. Fracture types included 15 AO type B, and 26 AO type C. We treat all our AO type A pelvic ring injuries non-operatively. The average age of the patients was 25.6 years (range 17-62 yrs). The mean follow-up period was 11.6 months (range 3-38 months). Surgery was performed within ten days of injury (mean 4.6 days). During the follow-up period patients were assessed for the common complications associated with this procedure, namely screw misplacement, neurovascular complications, hardware breakage and loss of reduction. All unstable pelvis fracture patients who present with haemodynamic instability have a circumferential pelvis binder applied initially. If they have a laparotomy performed the binder is converted to an external fixator. Our institution has an algorithm for the management of pelvic ring injuries but this is beyond the scope of this article. Anterior ring fixation was obtained first either via a plate-and-screw technique or external fixation. We used external fixation in patients with a confirmed genito-urinary injury due to our previous infection complications with anterior plating in the presence of a genito-urinary injury. The external fixator was removed at 6 weeks after injury. Placement of the percutaneous screws is performed under fluoroscopic guidance. The C-arm is positioned opposite the side of the pelvis to be fixed. We use a radiolucent orthopaedic table and the patient is positioned such that the C-arm can clear the base of the table to allow inlet and outlet view screening. All patients receive bowel preparation the day before surgery to enable fluoroscopic visualisation of the radiographic landmarks. We perform the procedure in the supine position and reduction is achieved by closed means and checked under screening. Closed reduction is achieved via traction on the leg or via a bone forceps applied on the iliac wing of the ipsilateral side and used to 'joystick' the hemipelvis. The entry point is determined on the lateral view in the S1 segment just below the iliac cortical density as per the standard AO technique. Once the entry point has been established the C-arm is changed to inlet and outlet views to ensure the safe advancement of the screw. We used 6.5-8 mm partially threaded cannulated screws in cases with pure dislocations and fracture dislocations and fully threaded screws for sacral fractures. Generally we used one screw for fixation, but in cases where reduction was difficult with one screw, we used two screws in the S1 segment and tightened these in sequence. Our current practice is to use one screw if it offers adequate reduction but to add a second screw if the first screw does not achieve our objective. We have found the cases that necessitated the insertion of two screws had a delay of at least seven days before fixation. Post-operatively, radiographs were assessed according to Starr's criteria for satisfactory reduction (within 10 mm of anatomical in any plane).9 Patients were then followed up and assessed at two weeks, six weeks, three months, six months and one year. All the patients had satisfactory initial reduction as measured using Starr's criteria.9 The maximum displacement was measured on the AP, inlet and outlet views of the pelvis. According to Starr's criteria, displacement of less than 10 mm is acceptable. One patient (2.4%) had misplacement of a screw with resultant L5 nerve fallout (Figure 2). The neuropraxia resolved after screw removal. The patient was initially treated with two screws and went on to union with the remaining screw. One patient (2.4%) had a misplaced screw without any neurological deficit (Figure 3). This patient also had two screws initially. The misplaced screw was removed without any further complications and the patient was treated to union with the remaining screw. One patient (2.4%) had screw cut-out with loss of reduction (Figure 4). This patient required revision with open reduction and fixation with a longer sacroiliac screw crossing the midline. The patient had a satisfactory revision and went on to recover without any further complications. With the worldwide increase in high energy trauma, there is a parallel increase in the amount of pelvic trauma. Unstable pelvic injuries requiring surgical stabilisation remain relatively uncommon. At our institution around 13 000 patients are seen annually in the Trauma Unit. Of these only about 40 patients will sustain unstable pelvic fractures requiring internal fixation. Traditionally many of these injuries have been treated by open procedures. The methods of fixation include anterior and posterior plating, trans-sacral bars and tension band plating. Open treatment of these injuries allows direct visualisation and therefore anatomical reduction of the fractures. The extensile exposures used for these procedures however lead to wound-related problems. In some instances the complications of the fixation have been more severe than the complications related to conservative management. High infection rates are related to these procedures. Infection rates as high as 27% have been reported.10 Open procedures can also lead to disturbance of the pelvic haematoma and secondary haemorrhage. A large proportion of these complications have been associated with the surgical exposures rather than the original injury. This has led to increasing interest in percutaneous methods of fixation as described by Routt et al. in 1995.7 The major advantages of performing percutaneous procedures are decreased surgical time and surgical exposure. This leads to a major decrease in blood loss during surgery, and the smaller exposure leads to far fewer soft tissue complications. A number of different intra-operative imaging modalities have been used to place sacroiliac screws. Previously described techniques include fluoroscopy, sonography, CT scan11 and computer assisted placement. Fluoroscopy is the imaging technique used in our unit. Addressing posterior pelvic instability in unstable pelvic ring injuries is important. Ignoring it can lead to failure of anterior fixation. It has been shown before by Henderson12 and McLaren13 that patients with residual posterior instability or displacement have worse outcomes. Relative contra-indications to percutaneous fixation are sacral dysplasia or other anatomical dysmorphism of the pelvis. These anatomical abnormalities may decrease the size of the safe zone for placement of sacroiliac joint screws.14 Poor intra-operative visualisation necessitates the abandonment of percutaneous fixation and warrants conversion to open fixation. Percutaneous fixation of injuries to the posterior pelvic structures is gaining popularity worldwide. The complications related to performing open procedures for posterior stabilisation are related to unacceptably high infection and wound breakdown rates. This has led to an interest in less invasive approaches to manage these injuries. Percutaneous techniques have been shown to have fewer wound-related complications than traditional open techniques. Our combined complication rate compares favourably with published literature. We have not changed our practice based on the complications we encountered as we believe these represented part of our learning curve. The weaknesses of our study are that it is retrospective and is a radiological assessment without inclusion of functional outcomes. 2. Rommens P. Is there a role for percutaneous pelvic and acetabular reconstruction? Injury Int J Care Injured 2007; 38:463-77. 3. Failinger M, McGanity P. Current concepts review. Unstable fractures of the pelvic ring. J Bone Joint Surg Am 1992;74A:781-91. 4. Schweitzer D, Zylberberg A, Co'rdova M, Gonzalez J. Closed reduction and iliosacral percutaneous fixation of unstable pelvic ring fractures. Injury Int J Care Injured 2008;39: 869-74. 5. Judet R, Judet J, Letournel E. Fractures of the acetabulum: classification and surgical approaches for open reduction: preliminary report. J Bone Joint Surg Am 1964;46-A:1615-46. 6. 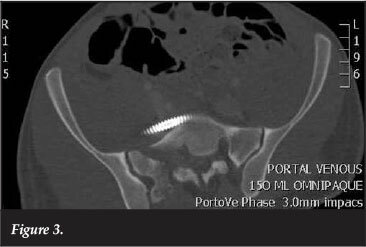 Giannoudis P, Tzioupis C, Pape H, Roberts C. Percutaneous fixation of the pelvic ring. J Bone Joint Surg Br 2007;89-B:145-54. 7. Routt ML Jr, Kregor PJ, Simonian PT, Mayo KA. Early results of percutaneous iliosacral screws placed with the patient in the supine position. J Orthop Trauma 1995;9:207-14. 8. Routt M, Meier M, Kregor P. Percutaneous iliosacral screwswith the patient supine technique. Oper Techn Orthop 1993;3:35-45. 9. Starr A, Walter J, Harris R, Reinert C, Jones A. Percutaneous Screw Fixation of Fractures of the Iliac Wing and Fracture-dislocations of the Sacroiliac Joint (OTA Types 61-B2.2 and 61-B2.3, or Young-Burgess "Lateral Compression Type II" Pelvic Fractures). J Orthop Trauma 2002;16:116-23. 10. Kellam JF, McMurtry RY, Paley D, Tile M. The unstable pelvic fracture: operative treatment. Orthop Clin N Am 1987;18:25-41. 11. 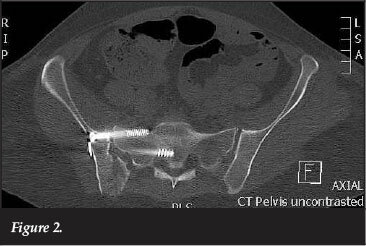 Sciulli, R,Daffner R, Altman D, Altman G, Sewecke J. CT-Guided Iliosacral Screw Placement: Tech Clin Exp 2007; 188:181-92. 12. Henderson RC. The long term results of non-operatively treated major pelvic disruption. J Orthop Trauma. 1989;3:41-47. 13. McLaren AC, Rorabeck CH, Halpenny J. Long term pain and disability in relation to residual deformity after displaced pelvic ring fracture. Can J Surg 1990;33:492-94. 14. Attias N, Lindsey RW, Starr A, et al. The use of a virtual threedimensional model to evaluate the intraosseous space available for percutaneous screw fixation of acetabular fractures. J Bone Joint Surg [Br] 2005;87(11):1520-23.